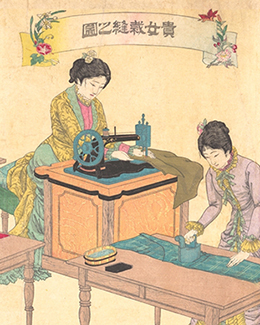 Ladies Sewing by Adachi Ginkō (1887). In the late nineteenth century, purple and red were used extensively in Japanese prints, earning them the appellation, “colours of the age.” The sensational visual effects, featuring bright, saturated colours, marked a strikingly different aesthetic taste from earlier prints. Those prints were often described as “decadent,” or associated with the West due to the use of imported synthetic dyes from Europe. Such perspectives, however, suggest a dichotomy between the traditional and the modern and between the plant-based colorants and synthetic dyes, as well as equate modernisation with Westernisation. As recent scientific analysis reveals, the sources of colorants were diverse. Printers constantly experimented and mixed different colorants to achieve desired visual effects. The use of colours signifies a more complex picture of the cultural, social and political transformation in Japan. Combining interdisciplinary approaches to art history, material culture and conservation science, this talk explores Meiji visual culture through the lens of colours, its relationship with colour discourse, scientific development, and the process of modernisation. Stephanie Su received her Ph.D. in Art History from the University of Chicago. Her research interests include the Sino-Japanese relationship, global modernism, histories of collecting and display, the politics of the past, and materiality of colours. Her research has been supported by the Japan Foundation, the Andrew W. Mellon Postdoctoral Fellowship in Cultures of Conservation, the Association for Asian Studies, and others. She was a visiting scholar at Waseda University, and the Assistant Curator for the special exhibition Appropriation and Transformation that explored modern Sino-Japanese artistic interactions at the He Xiangning Art Museum in China. Currently she is working on a collaborative project Fashioning Colours with the Worcester Art Museum (USA) to examine the transmedial relationship between Japanese prints and textiles. Her publications include “Towards a Global History of Art: Recent Studies on Twentieth Century Japanese Art” (Journal of Asian Studies, 2018), “Classicizing Creative Prints: Yamamoto Kanae in France” (Awash in Colours, 2012), among others.